We’ve scoured the plastic sheds 8×8 ft market determined to source for the most favourable, innovative and popular storehouse solutions constituting a weather-resistant design. If wishes are to substitute rotting issues for the leisurely convenience of a quickie wash to freshen appearances, hope you find this article helpful. 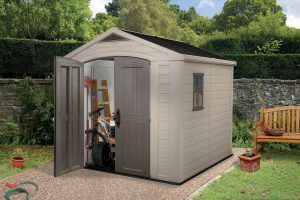 8 feet square regards a popular storehouse size, they’re able to locate in many garden plots and adequately spacious for accommodating a fair amount of gear, enabling emptying the home & garage from a wide variety of outdoor stuff. In return, organising creates more room indoors. Conserving a wooden shed demands yearly preservation services concerning re-coats of wood-stain varnishes & paint whereas forthcoming roof replacements are inevitable due to roofing felt’s inability to combat weather-decay. A complete enclosure of resin on the other hand enables sidestepping upkeep duties and the hassles involved. UV protected resin ascertains weather defence therefore you won’t be subject to corrosive nor decaying issues, it’s completely weather-resistant however their beauty lies within the external surface, the undemanding process of a simple wash down restores assembly day’s appearance in minutes. Comprising weather-resistant sturdily constructed fascia panels reinforced with a steel infrastructure and capped off with a well supported durable apex roof system to assure prompt drainage is effectuated on top meanwhile enclosed with an integrated strengthened floor to subsist challenging pressures and a light & airy internal atmosphere that coincides with lofty headroom height enabling to leisurely walk around inside. These recyclable resin manufactures have undergone UV stabilising to resist being susceptible to colour-bleach & fractures when suffering the afflictions of sunburn assault meanwhile in contrast to the conventional wooden hut, you’ll find washing down to maintain their complimentary appearance quite a doddle. A link to a full review regarding each shed is provided by the underlined title. Here, you’ll find more detailed information including internal/external dimensions, additional images & videos highlighting their features. Before we get the wheels in motion, better mention the foundation ruling all resin sheds must comply with. Foundations are seldom mentioned on shed sales sites yet are imperative for their ease of assembly, stationing and construction – best not overlooked. Wood-decking, existing paving slabs or concrete, including ground-materials like asphalt & tarmac provide an ideal base as long as they’re laid perfectly level. Those who prepare foundations accordingly generally take time to provide first-rate feedback through reviews whereas skipping this step frequently leads to struggles during installation. Preparation is key to accomplish a straightforward construction. 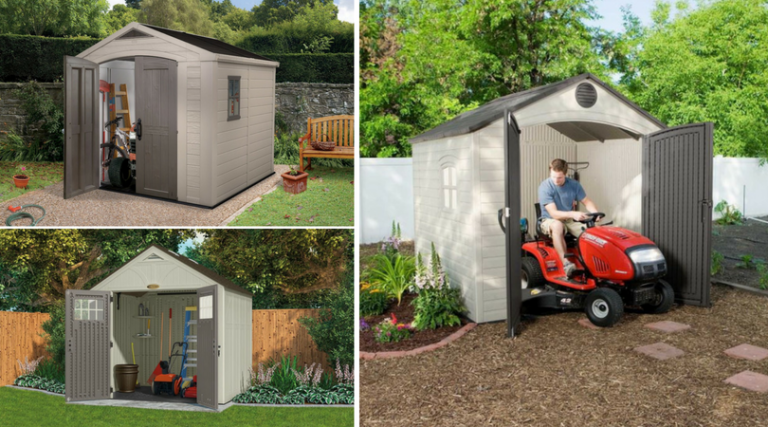 Factor’s range of low maintenance garden sheds have attained global sales & generate exceptional feedback with respect to their competitive price compared with quality of construction. If you’re wishing to restrict the budget somewhat, Factor’s deliver inexpensive storehouse solutions. Constituting a thickset UV protected polypropylene manufacture, molded to resemble wood panelling displayed in a matt beige shade escapes the glossy plastic look meanwhile up close, fine details of a grained texture enhance the fascia into a stylistic presentation, attractively two-toning with the taupe coloured doors. Owing to Factor’s competitive price tag, the roofs are absent from stylish slate effect molding however their makeup incorporates weatherproof polypropylene assuring built-in resistance to decay & impermeability to rainwater. A slanted roof structure ascertains an immediate rainwater run-off system whilst under-girding roof support lies a centred steel beam stretching across the internal width. Comprising one window plus an embedded skylight illuminates the interior during daytime hours meanwhile two air-vents situated opposite each other develop a fresh internal atmosphere. You’ll find these features deliver a bright & airy ambience to the roomy internals & help preserve storage from sweating. Although Factor’s broad twin doors open-up extensive access, comprise large-grip handles and exhibit stylish taupe tones they do however lack in quality hardware on account of sticking within a strict budget yet they are lockable. Slipping a padlock through the clasp secures both doors simultaneously. Factor’s built-in floor adjoins the walls enclosing the unit from the outside elements. You’ll find this enclosure beneficial in preventing waves of leaves accessing during Autumn, not forgetting blockading a crawl-through for critters meanwhile the floor’s robust enough to survive the hefty tensions lawnmowers endure. Lifetime are well entrenched in the marketplace for delivering low maintenance quality outdoor storage solutions. This 8 x 7.5 ft facility along with their 8 x 10 ft shed are probably the biggest selling sheds across America meanwhile their presence is starting to gain traction globally, including the UK. Comparing between the dominance of Factor and Lifetime sheds, Factor’s represent an inexpensive storehouse solution whereas Lifetime sheds constitute a much sturdier design that’s well braced together through additional steel reinforcements and further enhanced with stylish quality features, albeit this does increase the price. 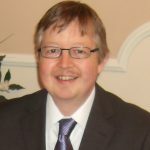 Lifetime’s method involves manufacturing High Density Polyethylene where the fascia constitutes two sheets of polyethylene connected together. Having a ribber internal structure delivers robustness & prevents dents appearing whereas the external side is molded into a creation resembling horizontal wood panelling comprising intricate textured details of grain flowing through, presented in spotless light beige shade. Both the fascia & roof panels are reinforced with a weatherproofed steel infrastructure meanwhile the roof is further underpinned by a couple of steel trusses expanding across the internal apex width providing snow support. Lifetime roofs incorporate steep apex pitches to overcome puddling and to ascertain the top delivers first-rate rainwater drainage meanwhile each roof sheet protrudes beyond the shed walls to conquer rainwater leaks dribbling inside at the walls connection. Reciprocating from the high angled roof peak returns a generous internal height of 2 metres from the trusses down to the floor whilst additional headroom above the rafters towards the roof peak means you won’t be banging your noggin moving around inside. 3 impact resistant skylights plus an opening polycarbonate window illumine natural daylight whilst ventilation grids built into the apex peak above the doors internally distribute fresh air to eliminate sweaty atmospheres. Lifetime’s wall-floor fitment encloses the shed from outside thereby aids to maintain a clean interior. The rot-free floor robustly supports the movements of a tractor mower plus there’s no need to worry about spilling solvents or oil, the anti-slip resin design is resistant to stains. Included with this model are corner shelves, straight shelves and metal hooks that slot into peg-strips for hanging gardening tools against the walls. All shelving sturdily mounts onto the steel framework however many of us incorporate stand-alone shelving due to their advantage in storing bulky storage high-up. Wide twin doors provide decent access, the option of keeping the left hand door closed by two internal dead bolts is catered for, full length galvanised steel hinge pins run the entire length of the doors meanwhile a metal latch system operates the opening by a push button design contained within the large-grip handles. A clasp designed for a padlock fulfils security. Fusion’s composite range of wood & resin storehouses comprise 3 sheds. 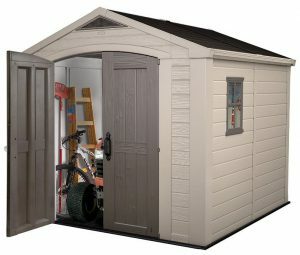 This 7½ ft storehouse, a larger facility extending 9 feet further to designing the most sublime 4 ft deep Patio Shed. If desires crave for traditional appearances, Fusions exhibit the looks, backed with imperishable resin – feedback’s captivating interest. Fusion’s composite incorporates a blend of wood & resin producing the natural richness of wood mixed with the weatherproof advantages of polypropylene therefore unsusceptible to decay assures their advantage when exposed to the outside environment meanwhile unlike conventional wood, Fusion’s surface merely requires a 2 minute whirlwind wash to freshen their stylish presence. The manufacturing technique involves molding 2 separate composite sheets and joining them together by an internal ribbed structure to enhance sturdiness meanwhile if you’re searching for a seamless construction process, Fusions composite fascia panels constitute tongue & groove edges. Their slip into place technique followed by aligning & screw-securing each panel against the metal framework simplifies installation. The roof exhibits the classic look and comprises improved strengthening. Dual lined polypropylene panels mould to simulate slate-tiling meanwhile steel beams reinforce snow-load support by stretching out across the internal roof width. The roof incorporates a steep apex design delivering effective drainage meanwhile an abundance of daylight is delivered internally through the full length skylight accompanied by the fascia & door windows. Situated above the doors, same at the rear, two air-vents combat saturation by generating a throughput of air circulation to the interior. Fusion floors are composed of a muscular resin manufacture that’s molded into a thickset durable bed. There’s no worries driving in hefty gardening machinery, additional toughening enhances the floor’s strength to subsist challenging pressures. The composite wall sheets interlock within the floor’s boundary enclosing Fusions from debris wafting inside meanwhile a sloped threshold assists wheeling-in the lawnmower. Unique to resin sheds, Fusion walls are screw-able attributed by their wooden manufacture which enables hanging long handled gardening tools adjacent to the walls meanwhile the lofty ceiling height overcomes stooping over when moving around inside. Wide strapping beefy doors open-up broad access, their makeup regards a double lining of polypropylene, tastefully crafted to resemble charcoal shaded wooden doors. Fitted with a stainless steel locking system and quality handle furnishes Fusions to high calibre whilst a padlock clasp functions locking-up. Suncast’s Tremont range comprises an 8 ft width along with 5 varying depths. This 8 x 7 ft shed is sandwiched between the slimline 4 ft Tremont and the larger ten footer meanwhile they receive mighty fine reviews across the entire range. Interesting to read from purchasers who opted to assemble two of these 7 ft Tremonts instead of constructing the larger 13 or 16 footers. After installing their first shed, they soon purchased a second which speaks volumes in my book. I’ve read a few similar Tremont reviews. Suncast’s method of manufacture is termed blow molded technology where the molding technique forms the fascia panels into multi-layered walls portraying a semblance of admirable wood panelling presented in vanilla shade to the external side whereas internally it’s formed to assure rigidity. The wall and floor sheets interlock with each other and secure into place with specially designed plastic screws around the steel infrastructure. Easy Bolt Technology is Suncast’s blueprint where you’re supplied with an hex-style screwdriver to drive in the screws, accomplishing a fast efficient assembly process. The high pitched roof resists puddles, ensures instantaneous rainfall drainage besides returning adult height proportions inside. The imperishable manufacture simulates a stylish slate design that’s resistant to rot meanwhile under-girding support lies a metal truss system spanning the rafters internally. Square door-windows and 4 skylights implanted within the roof bask the interior with daylight whilst ventilation panels situated on opposite sides distribute fresh-air to vanquish sweaty atmospheres developing, thereby safeguarding storage. Encasing the facility is attributed by interlocking the walls within the floor’s edge to stop the draught meanwhile carting hefty gardening equipment in & out presents no issues because the floor is purposely designed extra-durable & molded into a heavyset base, able to sustain the weighty stresses lawn-cutters endure. Tremont doors constitute a dual lined resin formation, immune from weather-decay meanwhile contain traditional handles complementing Tremonts modish charm. Two deadbolts keep the left door shut, 3 metal hinges per door functions their swing whilst a through bolt containing a padlock clasp effectuates closure & security. 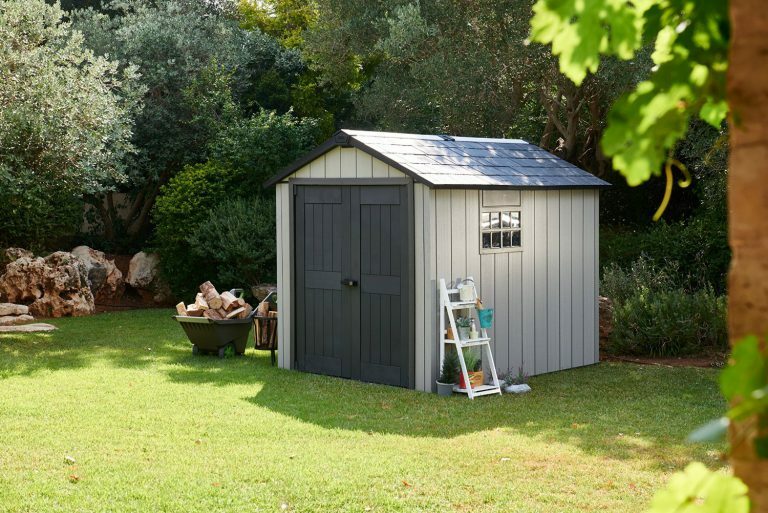 Keter’s innovative creation termed DUOTECH™ constitute an assortment of low maintenance outdoor storage solutions comprising a sturdy design that’s steel reinforced, from low-level stores up to walk-in sheds, like this Oakland presents here. DUOTECH’s zero maintenance composition provides the natural look and feel of weathered wood displayed in rustic style however this sublime appearance can be customised to your wishes. It’s paintable with easygoing acrylic emulsion and caters for decorating your colour choice to brighten-up the home-yard. 3 sheds conclude the Oakland range, the squarer 7 ft length represents the smaller size, this 9 ft depth middles the group whereas the spacious 11 footer tops the range off. On account of receiving reassuring feedback, Keter’s DUOTECH™ assortment has rapidly increased to include various patio stores, horizontal units, deck boxes, outdoorsy furniture and even a summerhouse called My-Shed. The future’s looking very rosy. Oakland’s rustic design constitutes UV protected polypropylene mixed with silvery pigments & resin talc, banishing the plastic look with pure style. The fascia panels are doubly lined, reinforced with a ribbed internal structure overcomes dents & improves stability meanwhile their tongue & groove border efficiently speeds-up installation. The roof’s resin manufacture is formed into twin lined panels and molded to resemble slate, capping Oaklands off in classic style meanwhile the roof strength is buttressed though supplementary supports, virtue of a series of steel beams spreading out internally across the apex width. A steep gradient roof-pitch effectuates a first-class drainage system meanwhile if you’re searching for a weatherproof shed that caters for customising and doesn’t entail future roofing felt replacements, Oaklands imperishable polypropylene remains ever-enduring owing to its immunity from rot. This 9 footer delivers daylight through the Victorian style window & full length translucent skylight embedded within the roof-ridge. The integrated floor blocks outside debris and rain from entering inside meanwhile extra strengthening thrown into the floor mix makes the composition able to subsist heavy-duty tensions endured by weighty gardening equipment. The only down side in my view with regards to hot climates concerns their absence of ventilation grids. Broad access for gardening tools is provided by strapping double doors whereby a sloped entry threshold assists wheeling-in duties. A stainless steel locking system functions the doors operation whist locking-up is catered for by a padlock clasp. More Competition – Bigger? – Smaller? 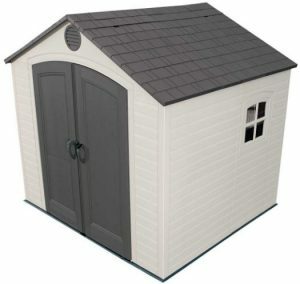 Shed Sizes displays a wide variety of low-maintenance quality plastic sheds stepping up in size order, scroll down to your preferred size. Which 8 x 8 ft Low-Maintenance Quality Plastic Shed would you choose? Hope this selection aids your decision. Please ask any related queries. Please share these 8 footers. Thank you! Its just amazing your writing your website i’m sure you will have more awesome visitors and you will have lot of comments. i hope i see your most amazing and beautiful posts soon. Hi Sam, thanks for dropping by to inspect this 8 x 8 ft ever-enduring storage shed selection and for your kind words. I have to say though, I’m no expert when it comes down to writing articles, my role is simply to help visitors make an informed decision with regards to choosing a particular weather-resistant storehouse out of the growing number available. My mission was to build a user-friendly website containing in-depth reviews of garden storage units comprising imperishable fascias that are unaffected by weather-rot. A place where visitors can stroll around at their leisure without being bombarded with pop-ups, email lists and advertisements. Instead, pick up genuine information to help their search. I also link to the most reasonable sets of prices where visitors can usually read feedback from those who have purchased that particular store however it’s always worth checking whether better deals are available. Nice sheds here. They look like tiny houses. I think this would be perfect for outdoor ride mowers and I’ll be checking out prices on these now. Well written and informative! Hi David, these walk-in storage sheds do look like tiny houses that can locate at the bottom of the garden – ha! However, their UV protected fascia’s are all recyclable and immune from weather related decay further to being a jiffy of an operation to freshen their presentations. We shower our shed down during the summer with the hose-pipe and that’s it, simple as that for our concerns! 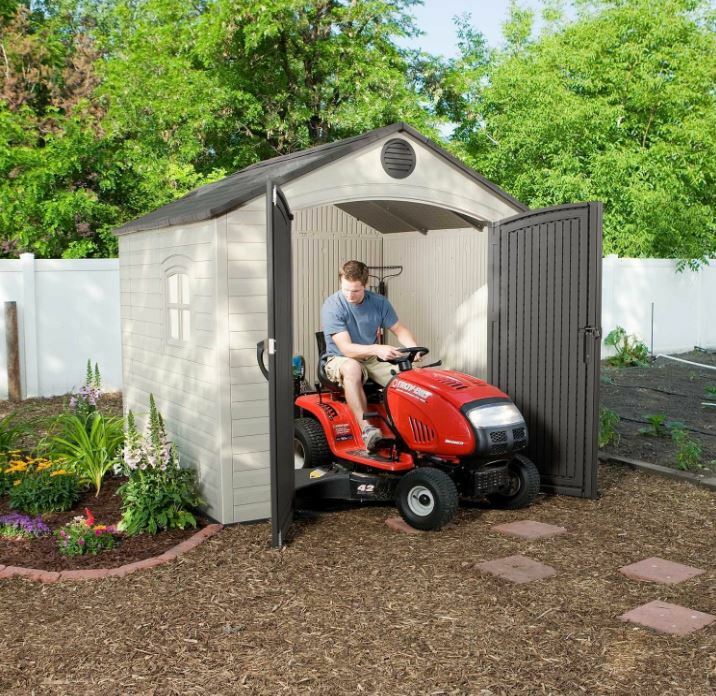 Before you pick your storehouse make sure the width of the ride on mower will fit through the doors. The only other importance is ensuring you have a solid and levelled substrate suchlike concrete for the floor to lay on and survive the tensions. All these floors comprise additional strengtheners producing a muscular thickset bed that endures the movements of tractor stresses however this is conditional to laying on the foundations described. I always try and point visitors the the most competitive sets of prices where they can usually scan reviews from those who have purchased, pointing out how the shed serves along with any pitfalls however it’s always worth checking whether better deals are available. 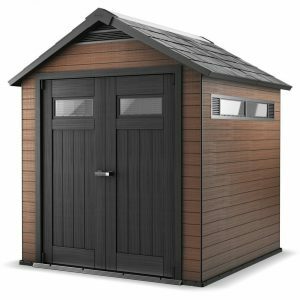 This post is so detailed that now I am spoiled for choice for the different types of sheds that I can chose from! How would you comment on the durability of the sheds? Are they able to last for a good time through different weather conditions? 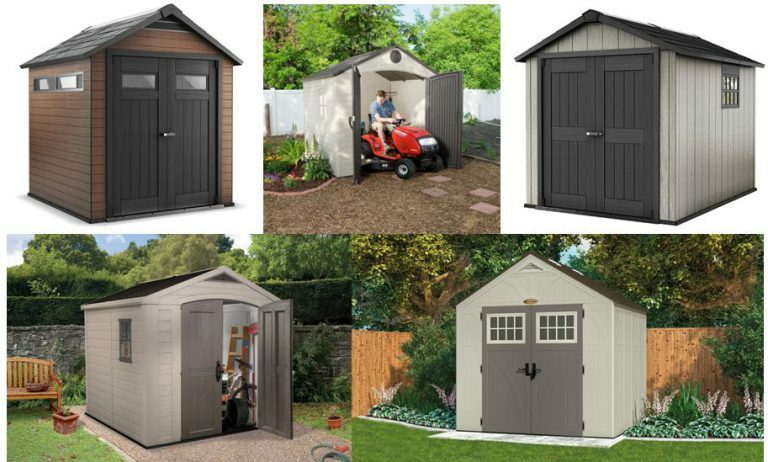 Hi Rox, there’s a varied selection in the way each shed displays presented here however they all provide similar weather-resistant manufactures that are easy to maintain, virtue of a speedy wash down. 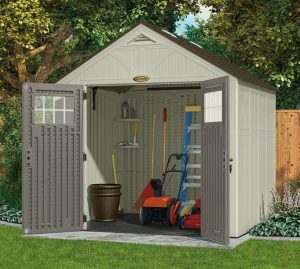 Durability-wise, all these sheds constitute a UV protected resin manufacture that withstands decay, sunburn attack and any other sort of weather-related deterioration. Polyethylene and polypropylene resins are ever enduring and ever lasting. The age in which they would start to decompose is unknown. Biodegradable – yes however to put a smile on our environmentally green friendly faces they are recyclable so when the time comes for dismantling and replacing they can be used again into alternative resin products. A hardware store I used to work for sells outdoor decking made of similar materials as these sheds, and for good reason; they last so much longer. The Duotech Oakland looks like a great shed. The natural look and feel of it appeal to me! 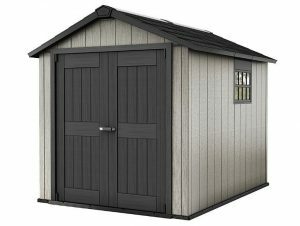 Would it be feasible to install an outlet and an overhead light in these sheds if I ever got the crazy urge to go that route? Hey Chris, composite decking boards are becoming a favourable option many are choosing to deck their BBQ and patio areas out with nowadays. They escape ongoing problems with wood rot and the annual conserving re-coats of varnish / wood stain in order to preserve meanwhile removing moss and slippery surfaces virtue of a bucket of soapy water and sweeping brush or the favoured pressure-wash method is a doddle compared with traditional procedures. Fusion sheds constitute a similar make-up, comprising a mix of wood and polypropylene to display the richness of wood backed with the weather-resistant armoury resin provides defence against. Yeah, I like Doutech’s Oakland too, because of the man-cave guise I suppose. I have just written a review on Lifetime’s Rough-Cut shed, a new model taking on a similar appearance to Oaklands. My guess is they are more sturdy than Oaklands plus they incorporate ventilation grids however Oakland sheds uniquely offer customizable fascia panels including a paintable surface delivering the option to make a statement in your colour schemes. Many people do install lightening into the Oakland storehouses, it’s the beauty of the Duotech design. You can drill into the fascia panels and jigsaw a section out to install electrics, a feature only Fusion and Oakland sheds cater for in a resin design to my present knowledge. I’m thinking seriously about getting a plastic shed as my old one is nearly falling down. 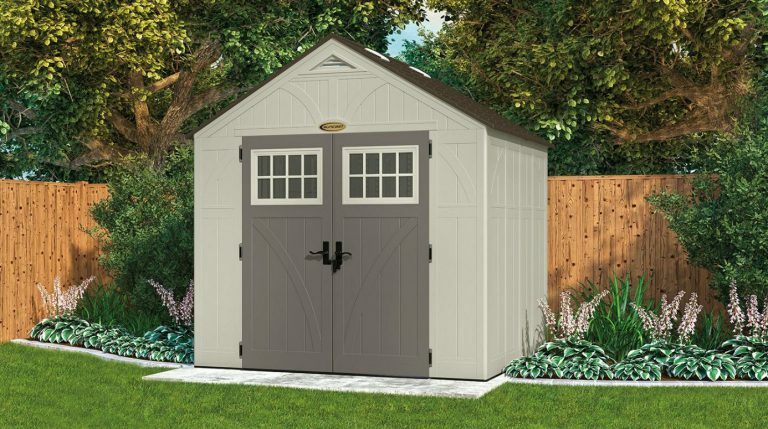 Loved all the benefits you have listed about these sheds and love the fact they are very low maintenance! Do The plastic sheds heat up in the Summer and if so, is there a way to disperse the heat? Thanks for calling in and reading about these various 8×8 ft plastic sheds. The reason we initially turned our attention away from the wooden design sounds similar to your circumstances. Ours too nearly collapsed, on its last legs through wood rot and I had simply got fed up with the yearly maintenance hassle required to make it lastable the following year. Low maintenance was our #1 priority and we much prefer the wash down when it get mucky as opposed to re-servicing duties. In a few minutes with a light hose down the shed rejuvenates back to assembly days condition. These plastic sheds are adaptable for all weathers, containing UV protection they resist splitting and fading when subject to the sun plus air vents are situated front and rear to maintain a fresh current of air to constantly flow through the unit, this prevents a sweaty atmosphere and increases storage protection qualities, heat is constantly dispersed. Great overview of a bunch of really great outdoor sheds. My husband and I have been looking for a good one for our backyard to store extra pool equipment and other odds and ends. Our backyard is on a slope, so our problem has been deciding on one that would best accommodate the slope, plus any heavy weight that might get loaded into the shed. Which one of these do you think might work best in our situation? Thanks for calling in and reading about these resin 8×8 ft sheds. There’s only one way to accomplish the correct construction where resin sheds are concerned and that is to assemble them on solid level ground. They won’t assemble correctly on a slope, only a perfectly level base will do. The reason foundations have to be level is that if you’re out of cinque on the base, you’re going to be well out of alignment 8ft up towards the roofing peak. A level base also aids in aligning the doors plumb plus a vertical stance due to the foundations being level ensures there’s equal pressure from the roof across all sides. Solid flat foundations ensure the built-in floor serves just as described, heavy duty. Seriously Jen I wouldn’t contemplate constructing a resin shed on a slope, only solid level foundations are appropriate.